The Bank of Japan building in Tokyo. By Wiiii (Own work) [GFDL (http://www.gnu.org/copyleft/fdl.html) or CC BY-SA 3.0 (http://creativecommons.org/licenses/by-sa/3.0)], via Wikimedia Commons. Kevin Carmichael has already commented on the Bank of Japan’s (BoJ) announcement today that it is joining the European Central Bank (ECB), the Swiss National Bank and the central banks of Denmark and Sweden in charging a negative interest rate on commercial bank reserves. (The BoJ will not apply the negative rate on all reserves, just new deposits.) Martin Sandbu has an interesting perspective on the BoJ’s decision here. With Japan added to their ranks, countries with negative rates now account for nearly a quarter of the global economy. What is going on here? Now, prior to the crisis, Ben Bernanke (then chairman of the Federal Reserve Board) warned that the global economy was suffering from a “global savings glut.” In part, this glut might result from the “forced” savings of Chinese citizens reflected, say, in large current account surpluses and foreign exchange accumulation. Absent the savings glut, the argument goes, the savings function S(YF) would be positioned closer to the vertical axis, intersecting the investment function at a positive rate of interest. Alternatively, it might be argued that investment is too low owing, perhaps, to a lack of innovation. (Could Robert Gordon be right? Or, is this consistent with Larry Summers’ fears of secular stagnation?) With greater investment possibilities the investment schedule would be shifted to the right, resulting in an equilibrium with a higher, positive real interest rate.Some might scoff that this is far too simplistic an approach; that reality is more complicated. They may well be right. But the point is that the model—which Classical as well as Keynesian economists should agree on—doesn’t rule out the possibility, a priori. where i is the nominal rate and πe is expected inflation, we would have a real problem if deflation rears its ugly head. Why? Because deflation is negative inflation, real interest rates would move higher, not lower. And if output is already below its full employment level (as assumed), deflationary pressures would increase further. But further deflation would drive the economy even further from the full employment equilibrium, creating even higher real interest rates. This scenario is, I think, what leads some, such as Joe Stiglitz, to argue that the world suffers from a global lack of investment—for whatever reason (Keynes’ animal spirits perhaps? Or my preferred explanation pervasive uncertainty and the option value of waiting in which firms are loath to invest and households fearing for the future save, holding off on consumption). The policy recommendation in such circumstances is clear: Governments should exploit the opportunity afforded by historically low interest rates to investment in the infrastructure needed to cope with an ageing population, relieve congestion in key transportation modes, making the economy more productive, and address climate change. Whatever the explanation, it is certain that the crisis pathologies that are the legacy of the Great Recession, or “Lesser Depression,” as Bard DeLong prefers, will continue to cloud the prospects for the global economy in the New Age of Uncertainty. For simplicity, start with the closed economy national income identity, Y = C + I + G, where Y represents output (GDP), C is consumption, I is investment and G is government purchases. 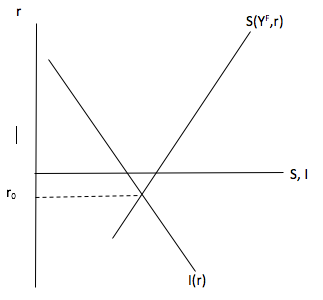 Rearrange to isolate investment and adding and subtracting taxes, T yields S = (YF – T – C) + (T – G) = I. This expresses total savings, S, as the sum of private savings, defined by the full employment level of output less taxes (=disposal income) minus consumption, (YF – T – C), plus government savings, or tax revenue less government expenditures (T-G). The investment schedule, meanwhile, which reflects the discounting of future cash flows from investing, the can be derived as described in an earlier blog post: Large Scale Asset Purchases, Keynes’ Internal Rate of Return and the New Age of Uncertainty.